Rail Traffic: Expect about 36 trains during a 24-hour period. 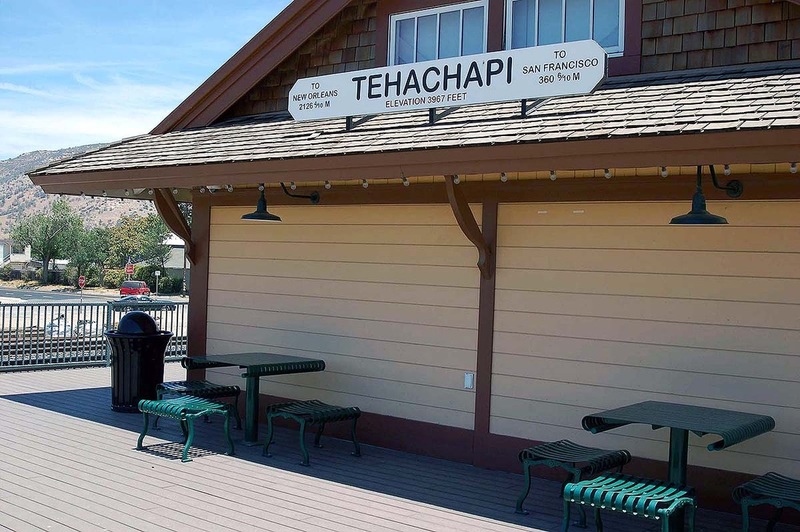 Site Details: Owned by the City of Tehachapi, the Tehachapi Depot was owned by the Southern Pacific Railroad. It was added to the National Register of Historic Places in 1999. 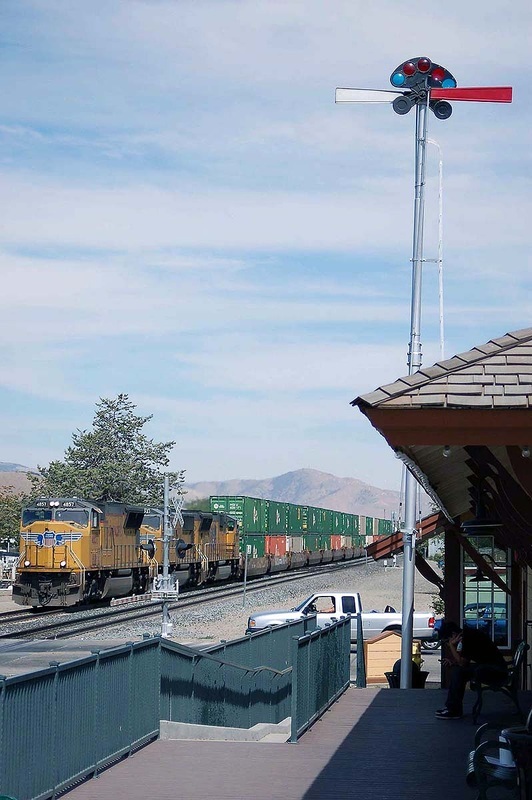 Renovation began in 2007 with plans of constructing a park around the depot, using the deck as a train watching location and operating a museum inside the depot. 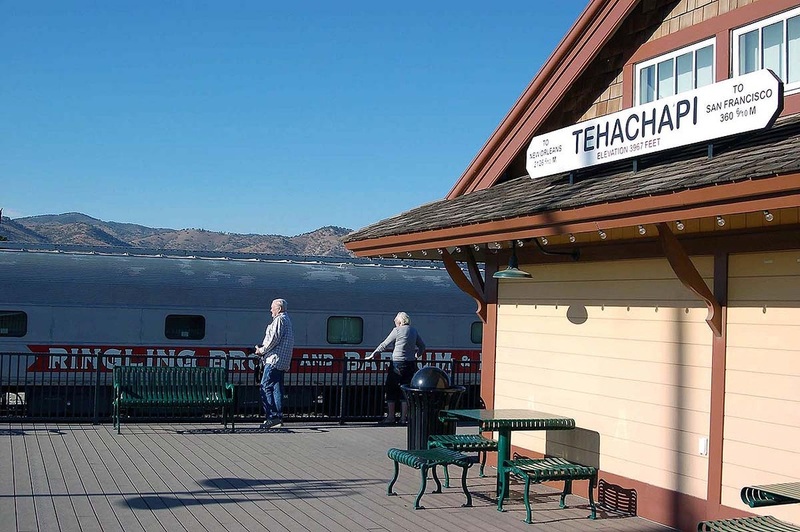 The depot is now home to the Tehachapi Depot Railroad Museum. The museum is free of charge (but donations are welcome). There is a small gift shop and there is always a Docent on duty to give tours and answer questions. The museum (depot building) is currently open 11am to 4pm Thursday through Monday. Closed Tuesday and Wednesday. The grounds are open 24 hours / 7 days a week for train watching. Restrooms on site: Yes, On the grounds during museum hours only. Currently 11am to 4pm Thursday through Monday. Closed Tuesday and Wednesday. Next door is Kohnen’s Bakery/Deli, open 6am to 6pm which has restrooms for customers. Food: Next door is Kohnen’s Authentic German Bakery, Café and Grocery (6am-6pm 7 days), across the street is Kelcy's Cafe (breakfast and lunch 7 days). Many others within a 3 block walk. Picnic Area: Yes, on the deck are some tables with bench seats and also individual seats. Parking: Free parking on the streets with a small (free) parking lot less than a block away. Lighted for evening railfanning: Yes. You can be on the grounds and viewing deck 24/7. Good viewing at night with city lights.